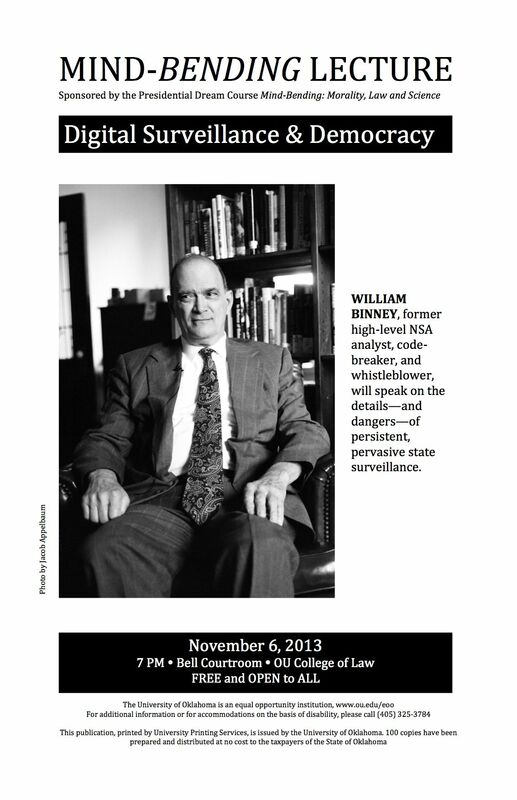 NORMAN--In a public lecture entitled “Digital Surveillance and Democracy,” William Binney will discuss the NSA’s eavesdropping programs and the dangers of a persistent, pervasive surveillance state. 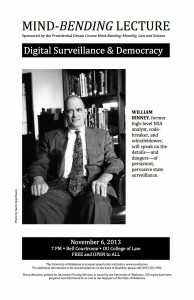 Mr. Binney, one of the best analysts and code-breakers in NSA history, turned whistle blower when the agency redirected the digital tools he had created for foreign spying to domestic surveillance after 9/11. The lecture will be held in the Bell Courtroom at the University of Oklahoma College of Law on Wednesday, November 6, 2013, at 7 PM. Mr. Binney is a speaker for an OU Presidential Dream Course lecture series sponsored by the course “Mind Bending: Morality, Law, Science,” taught by Douglas Gaffin (David Ross Boyd Professor, Biology Department), Joseph Thai (Presidential Professor and Watson Chair, College of Law), and Zev Trachtenberg (Associate Professor, Philosophy Department). The goal of the class is to provoke critical thinking on hot-button issues of the day, drawing on three great traditions in human thought. The class uses Dream Course funding to bring experts from around the country to offer the class intellectually challenging ideas, and to respond to students’ questions. Visiting experts also offer their ideas to the wider community in their public lectures. Emma Marris, author of the acclaimed book Rambunctious Garden: Saving Nature in a Post-Wild World, visited the class in September and gave a public lecture on “The Ethics of the Rambunctious Garden.” Mark Mitton, master magician and neurobiology enthusiast, tricked eyes and bent minds in October as a dream course speaker. For further information contact Joseph Thai at thai@ou.edu.